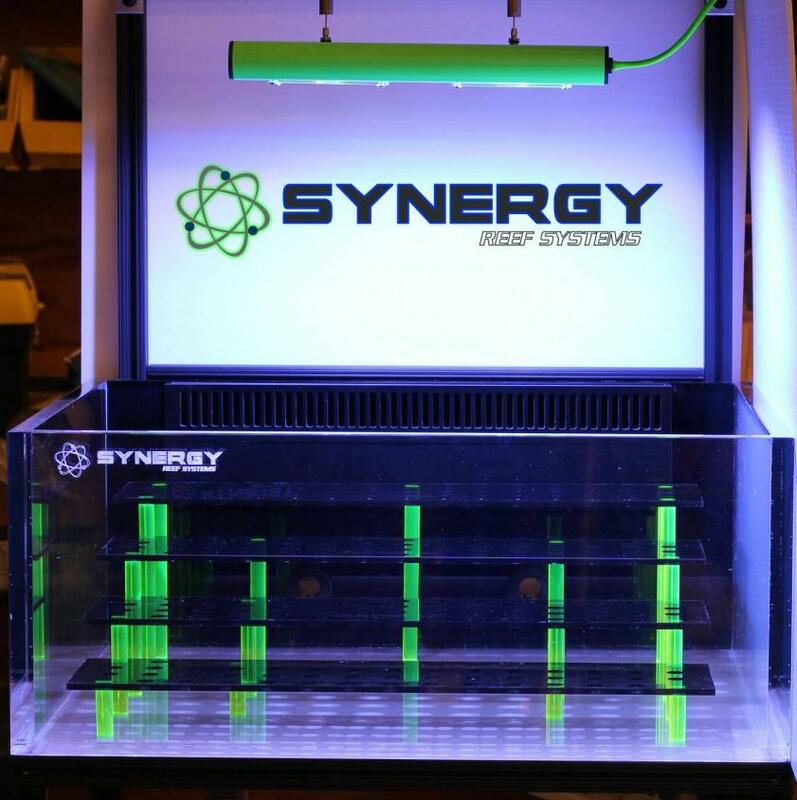 While we tend to focus on what is in the frag tanks at the various aquatic trade shows and not the aquariums themselves, the latest line of tanks from Synergy Reef Systems has us doing just the opposite. 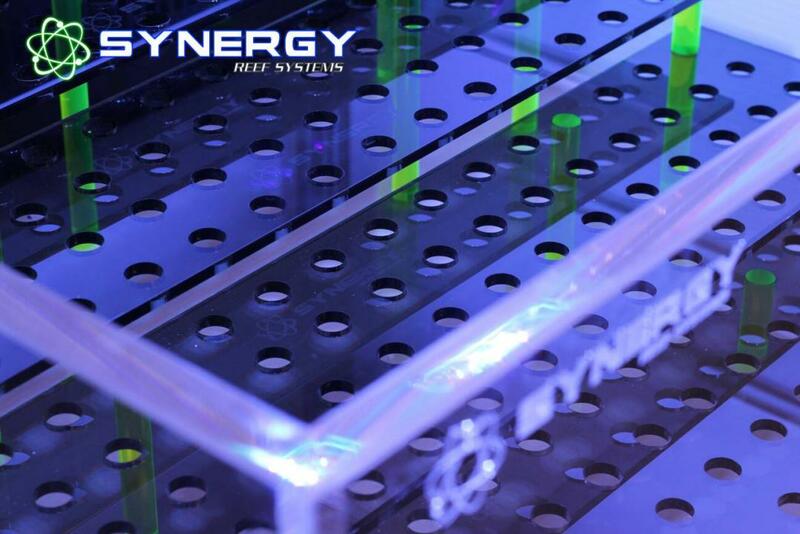 Best known for their Ghost Overflow and the use of neon green acrylic accent pieces, the Synergy trade show frag tank combines both of these features with one of their custom made sumps, their own media reactor, a set of custom frag racks, and a custom Duo LED fixture with Storm X controller from Nano Box Reef to create a compact yet powerful system that is sure to show off corals at their best. 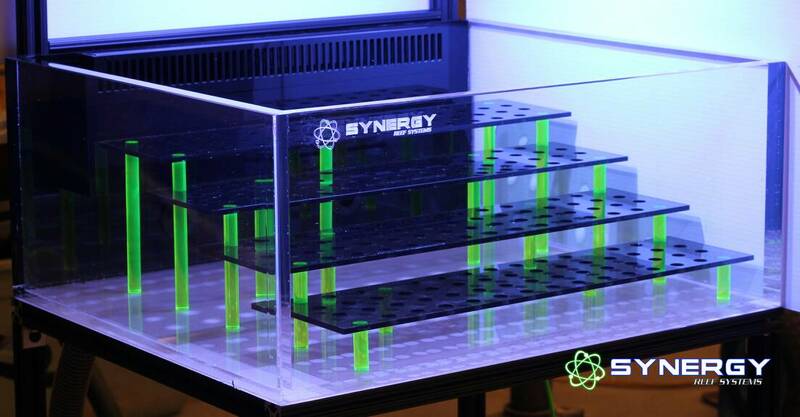 The frag tank measures 24″ x 20″ x 10″ (roughly 20 gallons) and is made from some rather thick 3/4″ acrylic. An 18″ Ghost Overflow moves water from the tank to the Synergy Reef SS-22 sump, which itself measures 22″x12″x15″. And to keep the water crystal clear while showing off corals at a trade show, a Synergy Reef SMR-2500 reactor sits in the sump and moves water through the filtration media of your choice, though carbon is the most likely one to be used at an event. Holding the corals in place is a set of four frag racks, which each measure 20″x5″ but vary in height to create a stair step look. These acrylic racks interlock to form one larger rack, which also cuts down on their overall footprint by a full 3.5″ for each. These are awesome looking systems that pack plenty of punch, and while it would appear that these are ideal for trade shows, they’d also be great for the home hobbyist looking for a turn key frag system to compliment their display tank. The other thing to note is the relationship that has been formed between Synergy Reef Systems and Nano Box Reef, the manufacturer of the light fixture. Like all of the acrylic work, these lights are hand made right here in the US and can be customized in a million different ways. They are powerful little lights that have been garnering a lot of attention as of late, and we love the endless configurations in which they are available.